Boniface is trying to convince his friend Kama to go straight and think about the future. But in a slum like Nairobi's Korogocho, where crime and violence are rife, is his mission possible? 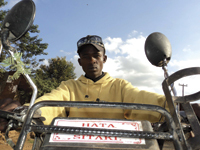 Boniface is one of the founders of the motorcycle boys, a team of young men who used to steal from their neighbors, but now provide an informal motorcycle taxi service around Korogocho. Kama is one of their latest recruits. They argue about money and crime, and a central question of slum rehabilitation: Is it better to start upgrading the place, or the people?